Enterox - Enterprise Software, Cloud Server hosts a variety of cloud based ERP software for automating and supporting critical business processes. It provides ERP modules for Supply Chain Management (SCM), Customer Relationship Management (CRM) along with several other ERP packages. Further, Enterox Enterprise Cloud also serves as a base for Custom ERP Solutions that inter-connects with other software systems and embedded computing devices, thus becoming an Internet of Things (IoT) platform for enterprises. 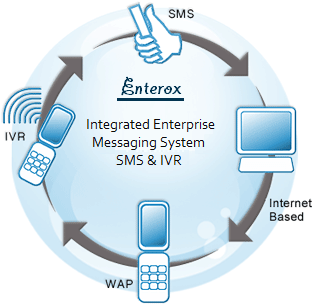 Enterox Enterprise Messaging, SMS Gateway and IVR System add automated communication feature to ERP Solutions available on Enterox Cloud. It provides Bulk SMS, transactional Text Messaging and Interactive Voice Response (IVR) capabilities to Business Solutions running on Entrox Enterprise Cloud. Enterox Enterprise Software supports Internet of Things, IoT platform protocols such as websocket and MQTT (Message Queue Telemetry Transport) that enables embedded computing devices to connect with Enterprise Software (Business Solutions). 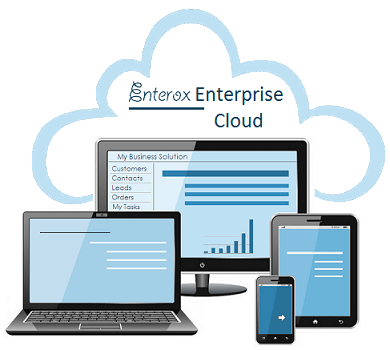 Enterox Enterprise, Integrated Systems are available as Cloud Services and also as Private Cloud Server (packaged Software and Hardware) providing integrated SMS Gateway, IVR System and IoT Gateway. Note: Enterox - Enterprise Messaging - Private Cloud Server is currently limited for companies in India only. Get Your Cloud ERP Software! Enterox Enterprise Resource Planning (ERP) Software as a Service also provides simple solution for Business Activity Management.